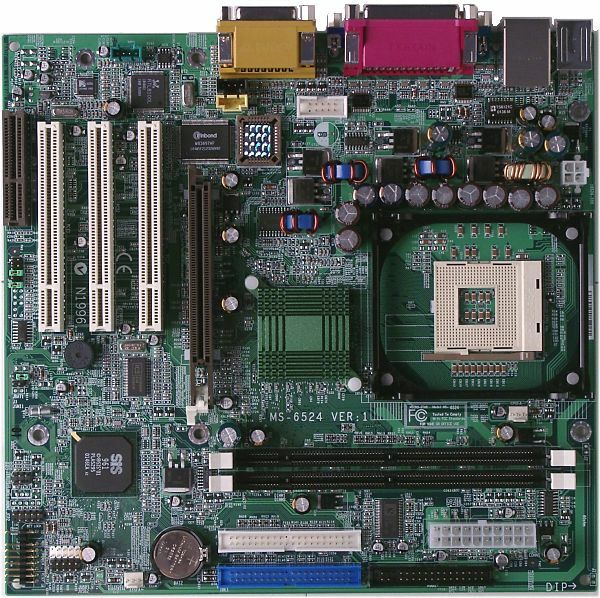 This is the first board on the SiS650 and the first on a chipset with an integrated graphics core meant for Intel Pentium 4 processors which we were able to get. We tested this board completely including the whole package of graphics tests. VNC - for remote computer access. The layout is not convenient, but it is typical of all boards of this format: all functional connectors are placed compactly. One of the serial ports is made in the form of a connector direct on the board as its place on the rear panel is taken by a VGA connector. The feed circuits incorporate 8 capacitors of 2200 uF, 3 of 1800 uF and 2 of 1500 uF. There are the following controllers: AC'97 codec ALC201A from Avance Logic (audio solution) - the chip supports SPDIF, but the respective connector is lacking, though there is one for audio-outs for the front computer panel; as well as a network controller supporting 10Base-T/100Base-TX - RTL8100L from Realtek. Non-unsoldered connectors: Wake-On-LAN and Wake-On-Ring connectors. Brief characteristics of the board: memory slots - 2 SDR SDRAM; expansion slots - AGP/ 3 PCI/ CNR; I/O ports - 2 COM/ LPT/ 2 PS/2/ 6 USB; dimensions - 245x230 mm. Minimal settings and the format mean that this solution is designed for budget system, and a solution on the Intel Pentium 4 will the the most optimal as far as price is considered.